So a week ago I decided to embark upon a new personal quest of sorts. I'm not exactly sure why, but I had an urge to try something new creatively. I wanted to find something could leverage at least some of my existing skills, but would push me to learn something new. 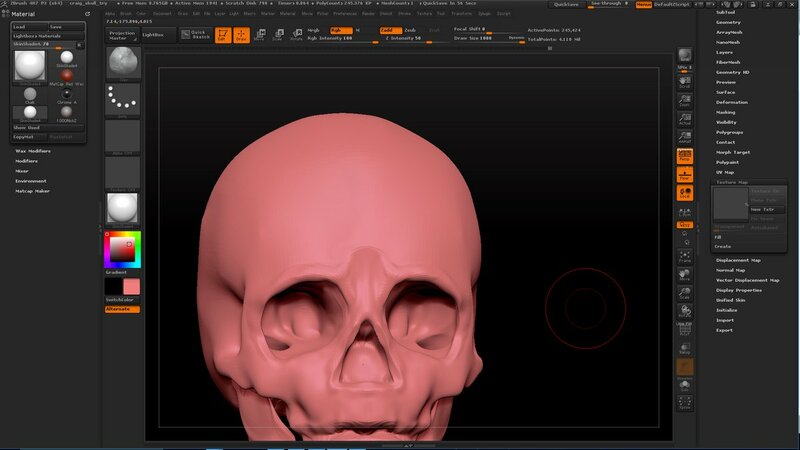 I have opened 3D software up before, and found the interfaces intimidating. I have a cursory knowledge of many aspects of working in 3D software design from being a part of talented game teams down the years. I had not however, ever actually tried to make something in any of them. 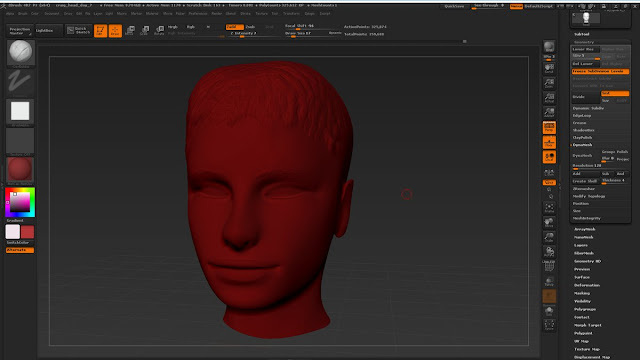 I figure I have sculpted in clay, and for my miniatures off and on for years (ok, mostly off, but I know the basics), so set myself the goal of seeing how good I could get with zBrush within the confines of their trial period. 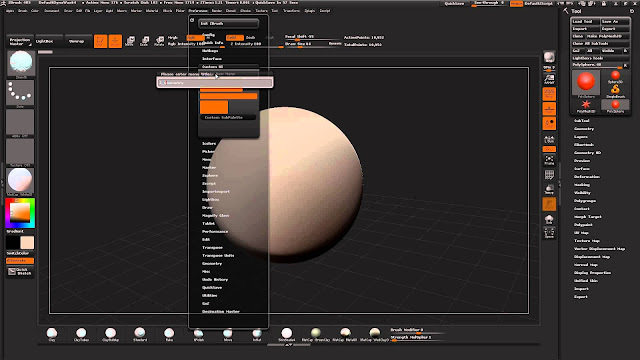 zBrush by Pixologic is a powerful piece of 3D software that does many things, but is most notable for being a digital sculpting tool for the creation of characters and creatures. Talented artists make amazing things with it each and every day. It's not a cheap piece of software (over $700) so if I'm ever to even consider taking that deep a dive, I want to see if I have any potential with it, and more importantly, if I enjoy it! 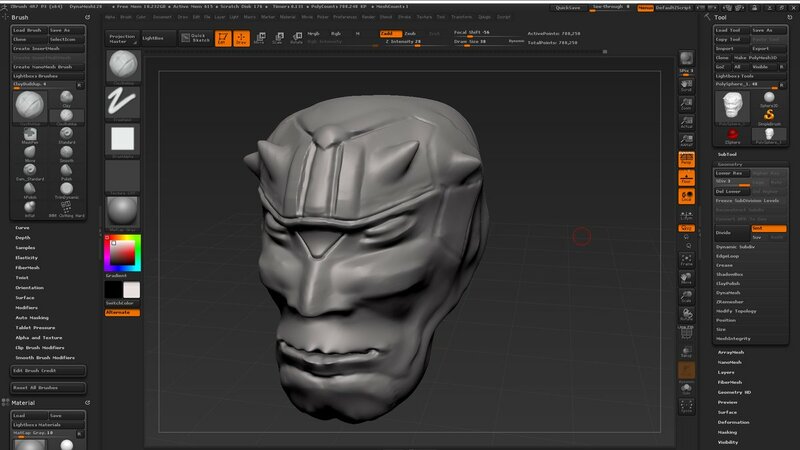 Teach myself zBrush in 45 Days. The trial ends on the 5th of November, so I have a month and a bit to see how far you can develop a new skill by dedicating a minimum of an hour a day to it. So I downloaded the trial and started out. 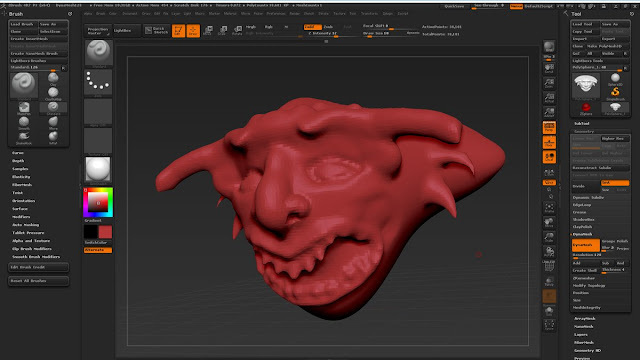 The zBrush interface is most definitely intimidating when you start out, and while I usually like to dive in and just start experimenting to learn new software. 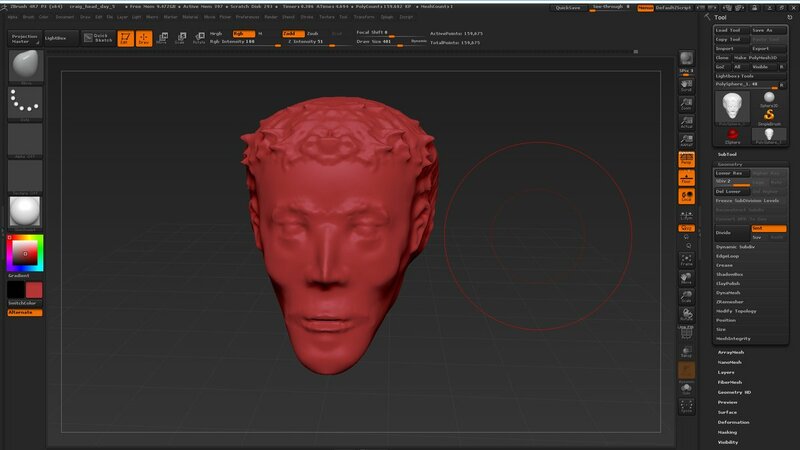 I don't feel that's really possible with something as deep and layered as zBrush. So how to start out? Pixologic have some starter tutorials on their site, so I started with this series. Those videos gave me a solid, first nights, start. I followed along, played with the tools as described, and started to get a good idea of the basics of the tool. Well, it was a start! Even vaguely human looking. The challenge for me was that I am a curious type and I was immediately trying to run ahead of myself, as that series of tutorials was giving you the very basics, in an easy to follow way. Which is great ... but ... I wanted more. That's mostly down to my character as I always want to understand the tools I use, and why and how they work, and dive a little deeper earlier, to then be able to experiment. So I started searching for some different tutorials. Many that crop up have the eternal tutorial issue of assuming various levels of knowledge of the tool already, and skip pivotal points that can dramatically impact what you can learn. It was a perfect series for me, as it focused on teaching you the tools at length and strengths and weaknesses of the various tools at your disposal inside zBrush. I feel that for too many starting out with a new piece of software this is a step that they all too often try to skip. I knew though, that if this little quest is to have any chance of success I was going to have to get familiar with the tool at this level. Personally I found this series to be a well paced, and insightful, intro to the power of the tools in zBrush. I feel that it started to arm me with enough knowledge to start to be dangerous! So each night I am dedicating a minimum of an hour to creating a sculpt. Mixing it up between humans and creatures to test out the different tools. My goal for the first week was simply to get comfortable with as many of the basic techniques as I could. 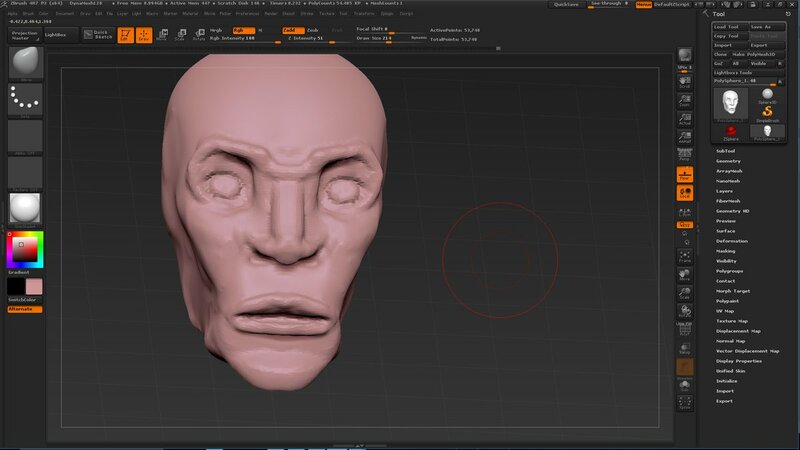 Day seven, and back to a human head, and some real progress now I'm getting the hang of using the dynamesh function properly! 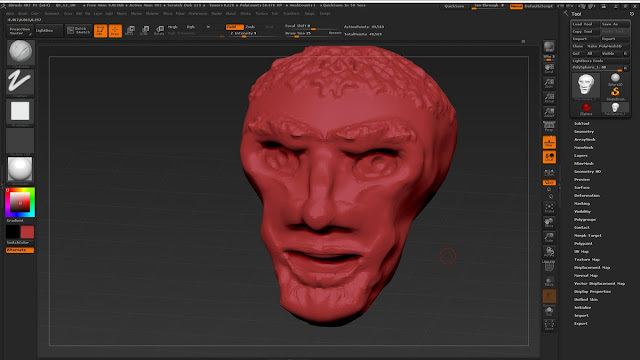 I'm logging my progress on Twitter every evening under the hashtag #45DaysofzBrush, so feel free to follow along if you want to join me on this quest. Let's see how far it takes me from that first sculpt!